Bexleyheath is the current administrative centre for the London Borough of Bexley and the main shopping centre for the borough. The second stage of the Broadway shopping centre opened in 2001. For almost its entire history Bexleyheath was a heath bordering Watling Street, the ancient Roman road between London and Dover. The heath was notorious for highwaymen, and coaching inns were built along the road to provide a refuge for travellers. These inns, some of which still stand today, were a stimulus for further development in the area. 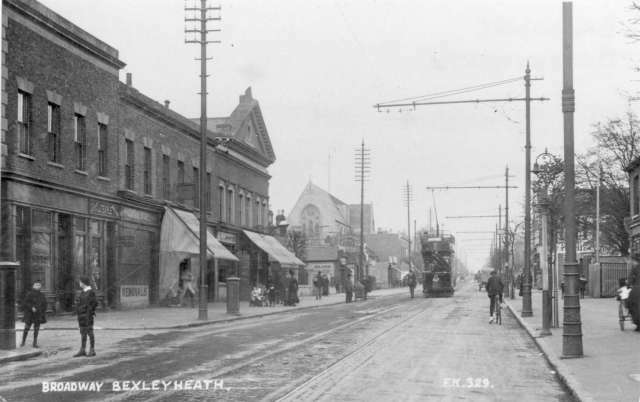 In addition the enclosure of the heath in 1819 meant that the land could be more easily developed and slowly the town of Bexleyheath grew to prominence, overtaking Bexley in terms of population well before the end of the 19th century. The first church on the heath was a chapel-of-ease built in 1836 near what is now Oaklands Road. This was followed by a permanent place of worship, Christchurch, in 1877. The area grew in importance until in 1880 it had its first representatives on the Bexley Local Board, one of whom, Alfred Bean, was the chairman. Bean was a railway engineer and entrepreneur who moved into Danson Mansion in 1862 and together with other luminaries such as William Morris (who built his Red House in Upton) helped to raise the profile of Bexleyheath. The Bexleyheath Railway Line arrived in 1895. The town was in the middle of a thriving agricultural area and had a market place that became the centre of the new development where the clock tower, built in 1912, is today. 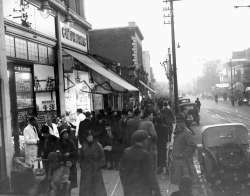 Commercial premises soon arrived and stores such as Penny, Son & Parker, Hides and Jenkins General Stores attracted shoppers to the area in great numbers. At the start of the 1930s the town was still concentrated along Watling Street, but by the end of the decade the picture had changed dramatically. The first major development was the Brampton Park Estate, built by DC Bowyer, with new roads being laid out between the old country lanes of Brampton Road and Pickford Lane. Smaller developments of the 1930s were built by New Ideal Homesteads in the Pelham Road area.